Successfully Added Usage Monitor and Intelligent Power Outlet Analyzer (EU) to your Shopping Cart. Our new model Usage Monitor and Intelligent Power Outlet Analyzer (EU), a cost and usage display type energy monitor and analyzer that allows you to save money by helping you understand how much energy your electrical devices use each minute, hour, day, week, month, or year. 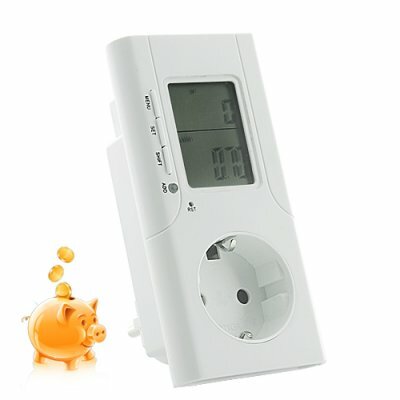 Simply plug your computers, appliances, and gadgets into the CVLR-G152 energy usage monitor and it instantly starts working to keep track of your energy consumption and displaying that information to you in a variety of user selected formats. Get useful data on accumulated power consumption, average power used, or even hourly, daily, and monthly power expenditure. With the costs of energy today, it is smart for every small business and homeowner to conduct a yearly energy audit. Why? Because, once you have your energy usage information you can analyze which appliances in your home or business cost more than they're worth to keep as well as forecast future energy expenses to help you to lower the electric bill and trouble shoot power supply or appliance problems. Take your refrigerator for example. Is it cheaper to keep your old refrigerator or buy a new energy saving one? How much energy does drying your clothes cost? What about energy use when you're using a fan at high speed versus low speed? Is your TV using energy even when it is turned off? How much does it cost to leave the computer on all the time? Now you can answer all these questions and more! Don't waste your time, money, and energy when one simple product can give you the money saving answers you need - pick up the CVLR-G152 Usage Monitor and Intelligent Power Outlet Analyzer right away to keep from throwing your hard earned money away! This EU version works with voltages from 180-260 and two-prong sockets common in Europe. So if you are living in the heart of Europe, you owe it to yourself to buy some for your home or business to help save yourself some Euros and save the environment at the same time. This product really does help save you money and it will pay for itself in no time at all! As always, this great device comes with our famous 12 month warranty and is proudly brought to you by the leader in direct from China wholesale electronics - Chinavasion! Simple Use Description: You input your electricity cost per watt and it helps you calculate amount of electricity used and the cost. Measurement electric quantity, voltage, electric current, active power, apparent power, frequency, power factor. This power meter can indicate working voltage, power, electrical quantity, cost setting and working condition. Of course! Just keep in mind that devices like these do not have a consistent energy usage pattern. There are many usage spikes through the course of a day. You will need to keep the CVLR-G152 plugged in for one whole week to see the true average daily usage for these types of household appliances.